Thos are the only complaints I have about New Mexico and its biggest city. It is a lovely state with awesome scenery. Albuquerque is neatly situated at the base of the mountains and as such it offers some excellent outdoor opportunities like hiking, mountain biking and horseback riding. The city itself has that cool Southwestern adobe building feel to it along with a little bit of grime. It is a fun place to explore and it is an easy shot from the very elegant Santa Fe and Taos. 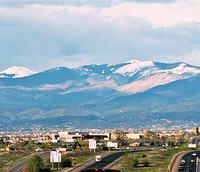 Priceline has a good deal on flights and hotel stays in Albuquerque. The offer doesn’t last for long so if you have ever thought about checking out North Mexico, now is as good a time as any to get thyself to Albuquerque. By the end of the trip you might even be able to spell it without spellcheck. I wish I could.